After reading Jamie's monthly rewind, I thought I would start doing something similar here! I always love how personal and genuine her posts are, and want to bring a touch of that to our blog. So without further ado, here is our monthly wrap up! "Cogsworth: Well, there's the usual things: flowers... chocolates... promises you don't intend to keep..."
1. This month was rough for both me and Amanda. It seemed like we were both tackling various projects every weekend, and then made an impromptu but much needed trip to Texas. 2. Work was super stressful for me this month, and I came home in tears almost every day. Teaching isn't for the faint of heart. 3. I have been working hard at becoming a better twitter-er! I was talking to a friend about how hard is it to tweet, because I feel like no one cares about my off the wall thoughts. Turns out, it is a great tool to connect with other bookish people, which I looooove. 4. Amanda celebrated her twenty-fourth birthday this month. She went home and spent a long weekend with her family and sisters, which is a rare thing these days. 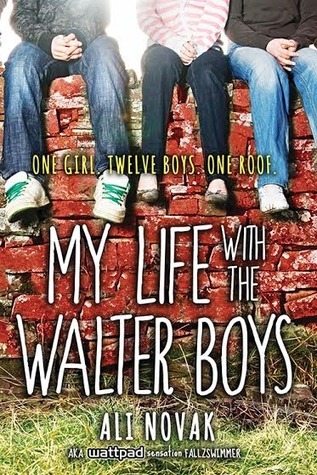 I am SUPER pumped that debut novel My Life with the Walter Boys was our most popular review! Ali Novak is a gem and has become a friend to both of us. We are excited to see where she will go! 1. SPRING BREAKKKKKKKK. This teacher needs a week off. While I don't plan on going anywhere, I do plan on getting some writing done (hopefully) and catching up on all the TV I've missed this season (I'm coming for you, Agents of SHIELD). 2. Warmer weather. I love winter. I love the snow. Scarves, sweaters, boots, etc. But this year Oklahoma has had a stupid cold winter, and I am ready for some sunny springtime weather. I recently bought several new dresses that I can't wear until the weather warms up as well. So of course, my desires are partially vain. 3. Making plans for this autumn. I have several potential opportunities coming up, and I am anxious to make a decision on where I will be headed. I am also a notorious planner. I HATE flying by the seat of my pants. So this is definitely a growing season for me, as I learn to be patient. 1. Spring Break: Luckily, I get nearly a full week off of work in the middle of March. You guys have no idea how excited I am about this. 6 days at home with my parents and both of my younger sisters (who will be home from college), and endless days of writing my novel, reading, and computer surfing with nothing to stress over. I am currently counting down my work days till spring break. It just can't get here fast enough. 2. Spring: I am done with winter. I never thought I would say that. I generally love winter. The clothes, the jackets and scarves, the bite at the tip of your nose, and the scent of chimney smoke in the air. That's my favorite thing, but this year, I am so ready for spring. I need to see some green grass and blooming trees. I need to feel the liveliness in the air again. 3. The Assassin's Blade by Sarah J. Maas comes out on March 4th (THIS TUESDAY!). Yes, granted all of these novellas were released online as ebooks, but I had both of her books in physical formats. It hurt too much to buy ebooks and when I heard that it would come out in hardback, I did not hesitate. So needless to say, I have yet to read them, so the hardback will be my first experience. I have such a love for Sarah's work. She is easily one of my top 5 favorite authors, so this is a book that I can't wait to get my hands on. Can I just say, DAMN. This woman writes the exact way my heart has been begging for me to write for years. "'I won't be that guy. I won't be that man who takes someone else's woman away.' [Dimitri said]… 'I don't belong to him… I don't belong to anyone. I make my own choices.' [Rose replied]." Though this isn't some profound quotation, this was something that made me whoop for joy. In normal romance teen fiction, you hear the generic "I don't belong to anyone, but I belong to you' crap. And I love how Rose is a strong enough character to step back and say, 'I don't belong to anyone. I don't even belong to the guy that I love. I belong to myself alone.' To me that is a great step of empowerment in teen fiction, and that's probably my favorite line just because of what it stands for. I love the idea behind these posts! Maybe I will join in next month! :) Happy reading!